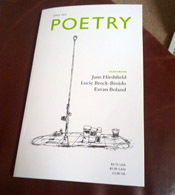 In the post today came a copy of Poetry magazine, volume 202 number 1 – yes, it’s been going for over a hundred years – gawds! The reason it was an unexpected bonus is because I cannot remember where or when I ordered it. But here it is, and with such a heritage the first adjective that comes to mind is ‘august’, although that already seems way too stuffy. I have to say it’s a thing of beauty – first of all, for a magazine to be even called something as simple as ‘Poetry’ is pretty impressive. Then there’s the lovely size – presumably an American shape – narrower than A5 but bigger than the average paperback, perfect-bound with a proper spine. Then the cool, clean fonts and layout – reminiscent of The Rialto, but the paper stock is creamier, slightly more retro. Am I sounding a bit fetishistic?? I haven’t even mentioned the contents yet. To be fair, it’s only just arrived so I’ve only skimmed it lightly so far – but I can see there’s a section entitled ‘A few more don’ts’ with the subtitle Ezra Pound set forth his now-famous “A Few Don’ts by an Imagiste” in the March 1913 issue of Poetry. In commemoration we’ve asked a few writers to update Pound’s essay for our time. Hello?? “In the 1913 issue of Poetry ….” Just how cool is that??? Anyway, can’t wait to read it. And I’ve already spotted and enjoyed poems by Eavan Boland and Jamaal May, so I have the feeling the whole magazine is going to be a bedtime treat for some while. Centenary/ Amazing! Am jealous now. Hi Clarissa – that’s probably why I had forgotten as well, I didn’t really think they’d send it. But hooray! A complete surprise to receive mine, too!